Tonight, I present Part 2 of the All-Time Tribe Uniforms Number 10! There is a gem or two in here, and even a player or two you may not have heard of (or I didn't anyway!). Enjoy! Thanks for reading and stay tuned for Part 3! Jack Brohamer - 4+ seasons (1972-75,part of '80) - His name has popped up a couple times before. He has worn #7, #8, and now #10. 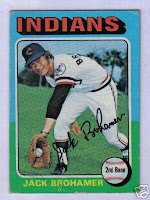 Brohamer wore #10 from 1973 through 1975 for the Tribe. During those three seasons, he served as the Tribe's lead second baseman, making 832 trips to the plate. He scored 77 runs and 75 RBIs on 204 hits, 28 doubles, 2 triples, and 12 home runs. He was walked 72 times and got hit 3 times (all in 1974), while striking out 59 times. While wearing Number 10, Brohamer earned a .245 average. Jerry Dybzinski - 3 seasons (1980-82) - As a youngster, I always thought he had a cool name. Of course, his first name was my Dad's first name, so that probably had a lot to do with it back then. According to Wikipedia, he was the first graduate of Cleveland State University to play in the Majors. That's kind of a cool "first" to have under your name. Dybzinski played backup shortstop for Tom Veryzer and served as utility 2nd baseman. He played in 114 games in 1980, and 128 total over the next two years. While wearing an Indians uniform, he had 123 hits, 17 doubles, 3 triples, and a single home run. He scored 61 runs with 51 RBIs, was walked 39 times and hit by 5 pitches, and struck out 68 times. He was traded to Chi for Pat Tabler in 1983, after posting an Indians career .253 average. Jerry (Gerry) Moses - 1 season (1972) - Another Jerry, though I do not remember this one until I saw his card. He came to the Indians from the Angels, played in 52 games, and was promptly paired up with Graig Nettles in a trade over to the Yankees. While playing for the Tribe, Moses had one of the worst seasons of his career, getting just 31 hits and 3 doubles on 141 at-bats. He did score 9 runs (4 homers) with 14 RBIs. Unfortunately, he also struck out 29 times, leaving the Indians with a .220 average. 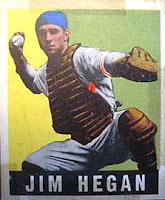 Jim Hegan - 14 seasons (1941-42, 46-57) - In case it has been a while, remember I chose Hegan as All-Time Triber in a #4 uniform. During his career as an Indians player, Hegan wore #4, #9, #10, and #40 - which means we will see him again much later. He wore #10 for four seasons and for THREE of those seasons, he was chosen for the AL all-star team. In 1948, he went 4-for-19 in the World Series. I'd say #10 was a pretty good number to have. From '47-'50 (his #10 days), Hegan made 1,733 plate appearances, scoring 205 runs with 216 RBIs on 407 hits, 70 doubles, 21 triples, and 40 home runs. He was walked 180 times and struck out 264! Talk about a guy who went down swinging... He was only hit by one pitch during that time, and that was back in '47. Unfortunately, his batting average fell from .249 to .219 during those years, each year losing a bit at a time. He ended his #10-wearing days with an overall .235 average. He did manage to hold a .991 fielding percentage while sporting the #10 jersey. You can't deny that this guy was good. Jimmy Wasdell - 2 seasons (1946-47) - Does the name sound familiar? We first met Wasdell back in Uniform #1 (where he had batted just one time). He wore that jersey number in 1947, but donned #10 for his first year as an Indian. As a #10-wearing member of the Tribe, Wasdell hit a .268 average with 11 hits, 1 run, and 4 RBIs on 41 at-bats. A fan of the "fours," he also walked 4 times and struck out 4 times. After his single game the next seasons, he was released. Joe Becker - 2 seasons (1936-37) - We met Becker wearing #8, but he started with the Tribe in a Number 10 uniform. He batted in 22 games his rookie year, averaging just over two at-bats per game. His rookie-year .180 batting average reflects a rough first year with just 9 hits on 50 at-bats, though he did score 5 runs and 11 RBIs on those 9 hits, plus he got 3 doubles, a triple, and a home run. He struck out only 4 times and was walked 5 times, all of which accounts for his .340 slugging percentage and his .255 on-base percentage. Jolbert Cabrera - 4+ seasons (1998-part of 2002) - Cabrera came to the Tribe after spending nearly a decade in the Expos minor league system. We first met him wearing uniform Number 6. He only wore the Number 10 in his last season (partial, that is) with the Indians. During that seasons, he batted 72 times in 38 games, scoring 5 runs on 8 hits with 7 RBIs and 13 strike outs. He ended his Indians career batting just .111 in 2002 before being sent to the Dodgers. Jose Vizcaino - 1 season (1996) - Frankly, I was surprised that Vizcaino only played one season for the Tribe. I would have sworn he had several years in Cleveland under his belt. Guess that just goes to show that a player can make quite an impact on a fan. He batted .333 in the Division Championship that year after batting a .285 on the regular season. During his one-year stop in Cleveland, he scored 23 runs on 51 hits (out of 179 at-bats) with five doubles and two triples, bringing in 13 RBIs. Kelly Shoppach - 2+ seasons (2006-Present) - Shoppach came to the Tribe in 2006 from the Red Sox, and would go on to help the Tribe make to the 2007 World Series. During his first two seasons, he made 271 plate appearances, getting 69 hits, 19 doubles and 10 home runs. He scored 33 runs with 46 RBIs, striking out 101 times. Ouch. He is a strong part of the Tribe line-up. On a sidenote, his Wikipedia entry reads like the back of an old Topps baseball card: "Shoppach's favorite TV show is Survivor; His favorite movie is Crimson Tide; His favorite celebrity is Ed Harris; He enjoys going to the movies; He is classically trained in the clarinet; He enjoys Chocolate Glazed Donuts and was a regular fixture in Mark Bellhorn's Dunkin Donuts franchises."